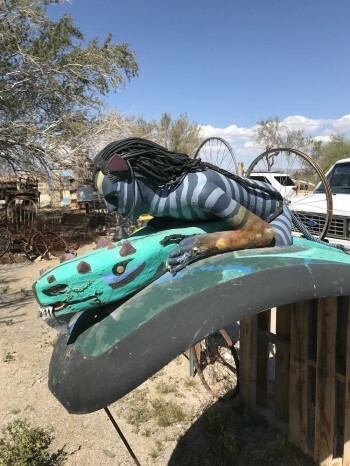 We were excited to be visiting The Wine Artist with a group of food writers from the International Food Wine & Travel Writers Association. Located in Lake Forest, California (in Orange County), The Wine Artist is owned by talented MJ Hong who is always the most gracious host. 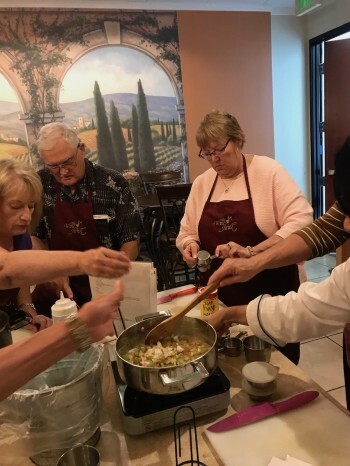 The Wine Artist offers cooking classes, often focused on team building for companies, and also is available for privately arranged events such as birthday parties, wedding showers or charitable events. The venue also offers custom-labeled wine. While from the outside the venue looks like just another business in a modern industrial park, the charming interior décor of The Wine artist transports visitors to Tuscany with its tapestry hangings, warm furnishings, and welcoming wine bistro setting. 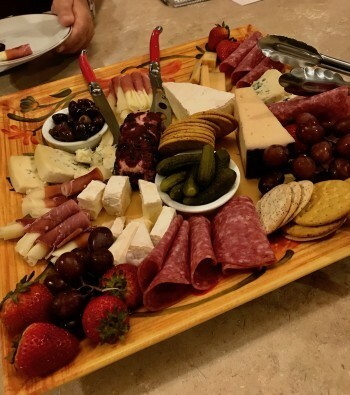 A table was set with an enticing charcuterie platter and a variety of wines. But the focus of our visit was the cooking table all set up for our preparation of an authentic New Orleans meal. We would soon find ourselves preparing beignets, jambalaya, shrimp étoufée and bananas foster. MJ is so well organized. Every ingredient and cooking utensil was waiting for our efforts to begin. There is nothing like cooking your own meal with friends and then sitting down to savor your efforts with good wine and conversation. We knew we were in for a wonderful afternoon. All the way through the process of preparing these dishes, MJ gave us all kinds of tips on how to make preparation and cooking easier and more fun, with great results. While we could have followed these recipes from a cookbook, this interactive cooking experience was so much more enjoyable and we learned more under MJ’s animated guidance. We soon divided into groups with different tasks and started cooking. We prepared each dish according to MJ’s instructions. Many of these steps happened simultaneously, with different people tackling each task. Our first step (after imbibing on charcuterie and wine) was to get traditional beignets going. This famous New Orleans pastry is probably that city’s most celebrated indulgence. We mixed the dough ingredients in a large bowl and then placed the dough on a floured surface and kneaded it until smooth. (There is nothing as relaxing as kneading dough.) We then covered the fragrant dough and let it rise for about an hour. (For future reference, we learned we could even let the dough rise overnight in the refrigerator.) Later, after the dough had risen, we brought oil in a deep skillet to about 350 degrees Fahreneheit. Meanwhile, we rolled out the dough and cut it into small squares. We then fried each dough piece in the simmering oil until they were golden brown. 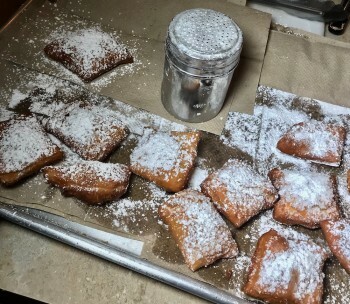 We drained the beignets on a paper towel, sprinkled them with powdered sugar, and savored every last bite. These were every bit as good as those at Café du Monde in New Orleans —and we had the satisfaction of knowing we had made them ourselves. We divided up tasks for this easy jambalaya recipe. While a few of us sautéed bacon and sausage, adding chicken, others chopped what MJ calls The Trinity (of vegetables): onion, celery and green pepper, which we added to the sautéed meat, along with garlic of course. We then stirred in uncooked long grain rice, and a special Cajun seasoning called “Slap Ya Mama.” We added chicken broth and tomatoes, bringing the mixture to a boil and then covered it at reduced heat for about 15 minutes of simmering. Next we stirred in peeled and deveined raw shrimp and green onion and cooked the mixture for about 5 minutes. Now it was ready to serve and savor. This is my favorite Creole dish and I was so excited to learn how to make it. First MJ showed us how to make a roux by melting butter in a large saucepan, adding flour, and stirring constantly until it was just the right golden brown color. Next we added the chopped Trinity again along with garlic, salt, and creole seasoning. When the vegetables were soft, we stirred in a vegetable/seafood broth we had made earlier, canned diced tomatoes, and Worcestershire, which we brought to a boil. After simmering about 15 minutes, we added a half pound of peeled, deveined shrimp, parsley and green onion. In about 5 minutes the shrimp was cooked and we added butter and stirred. Served over rice, this was so delicious and really simple to prepare. (Of course, MJ makes everything seem simple.) I am planning to serve this dish to my bookclub next month when we will be discussing a New Orleans-focused book. This classic New Orleans dessert was surprisingly easy to prepare. We combined butter, sugar and cinnamon in a large skillet and heated the mixture until the sugar dissolved. Then we added bananas and walnuts and cooked for a few minutes until the bananas were soft. Next we added rum and cooked a bit more until the sauce was bubbly and oh so aromatic. Served over ice cream, this was a heavenly delight for sure. The fact that we had cooked this meal ourselves made it so special and certainly bonded us as a group. 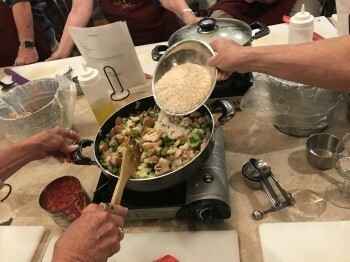 Not only did we enjoy a delicious lunch together, but we left with a sense of accomplishment and with new knowledge we could take back to our own home kitchens. Look at The Wine Artist’s website to see details about upcoming cooking classes. There are so many enticing options this fall, such as Wine, Cheese & Chocolate, Taste of France, Herbs & Spices, Holiday Desserts, Holiday Appetizers and even a Keto class. The Wine Artist is located at 21064 Bake Parkway, Suite 100, Lake Forest, California. 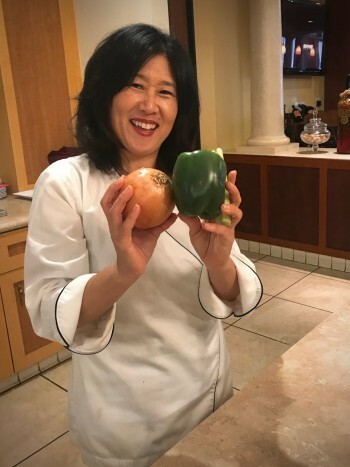 You can make reservations for classes online or call MJ Hong at 949-297-3656 for reservations or to arrange private parties.